This time we will look into audio processing modules of Absynth. First we will look into filters and wave-shapers and then also in few special audio modulation processors such as ring-mod and frequency shifter effect. Since this is a beginners tutorial I will explain main features of every module and it’s most common uses to get you started. I strongly recommend to explore and experiment with these effects as much as you can to discover combinations you really like and by using them you will be able to create much more unique and personal sounds in Absynth much faster. Absynth offers wide variety of filter types. Among standard filters it offers also few with more exotic features. Filter in Absynth can be inserted in any of the slots except the very first ones in channel A, B and C which are reserved for oscillators and the last one in Absynth audio chain which is reserved for Absynth’s master audio effects. In the main panel of the filter you can find three main controls. Cutoff frequency parameter can be displayed in two different modes. In the Hz mode the cutoff frequency is set with fixed value in Hertz. In the Trans mode the filter cutoff frequency is relative to the note played. This means filter cutoff frequency tracks the pitch of the incoming note. So higher pitch means also higher cutoff frequency of the filter. You can transpose and also invert the tracking behavior of the cutoff frequency by using negative Trans amount. Now filter closes with higher pitch values and opens at lower ones. The next parameter is resonance (in the comb filter mode this parameter it is also called Feedback). This parameter is strongly dependent on the filter type you are using and also on the feedback settings of the certain filters as we will see later on. dB parameter simply offers control over filter output volume level and is used for compensating the filter overall loudness. Absynth offers two main groups of low pass filters. The first group of LP filters are the Pole ones. These are analog design lowpass filters. Every filter pole corresponds to a steepness of -6 dB per octave so 2 Pole LP filter means that the filter dampens the signal by 12 dB each octave higher. First three filter types LPF 2 Pole, LPF 4 Pole, LPF 6 Pole have much softer and rounder sound than other three LP filter types available in Absynth’s filter. The other three LP filter type LPF-6dB, LPF-12dB, LPF-24dB are a bit more aggressive and rougher sounding filter than those pole ones. Note that one Pole corresponds to -6dB attenuation of the signal per octave so these filters offers the same slopes as the pole ones, just their character is different. There two types of HP filters. -6dB HP filter and -12dB HP filter. The controls are same as in the LP ones. Absynth has also one bandpass and one notch filter. In notch filter there is also a bandwidth parameter which defines the bandwidth of the filter around the middle frequency in octaves rather than in Hertz. Allpass filters are filters that actually allow all frequencies to pass trough they only modify the phase of the sound. These filters can be used in many creative ways. At lower resonance values these filters produce phasing sounds, very useful for sweeping and adding some movement to the sound but without also changing the frequency content of the sound too drastically. At higher resonance values these filter produce more of a resonating effect. Some interesting effects can be produced again without altering the frequency content of the waveform too much. Very useful for long, evolving sounds. Here you can hear automated cutoff freq of an Allpass filter with simple saw wave for it’s input. Comb filters change the sound by delaying the signal by a few milliseconds and then mixing the delayed signal with the original. This filter is very useful for producing phaser or flanger type of effect. Also with moderate settings it can produce natural sounding tones very useful for emulating real instruments and other natural tones. Super comb filter is a bit more advanced comb filter and it offers some very interesting ways of altering your basic waveform. The first panel of the filter is the same as with the comb filter above. Like some of the other filter types as we will see later on it also offers feedback control. The third panel is unique to this filter type. 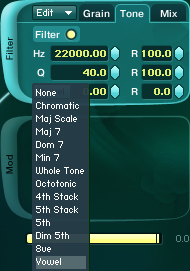 You can select resonance mode. You can choose between raw, natural, resonant and synthetic modes. As names suggest some very interesting effects can be produced, from very natural sounding and subtle effects to very extreme transformations of the signal. Tones controls the brightness and emphasis of different frequency regions of the tone. It is highly dependent on feedback amount set in main filter panel. HP and LP controls the high and low frequency damping. This is another very special filter. It works as a grain delay processor. It samples little fragments of sound from your waveform and rearranges them in different ways. This can produce some very exciting and unusual effects and modulations. Everything from subtle tone shifting to dissonant clouds of sound very useful for drone and ambient sounds. You can alter the frequency of created grains with trans parameter in semitones. To specify how many grains are created per second use the Rate control. The Del (delay) parameter controls how much time it takes for grain to be heard (in milliseconds) after it is being sampled from the signal. On the right side you can see R parameter. This randomizes corresponding parameter for each grain. The value of the R parameter is the max possible deviation of certain parameter value for each grain. In the Tone section of the cloud filter you can find filter which filters the grains in the sound. Again, R parameter randomizes the cutoff and resonance values so each grain can have its own random cutoff frequency and resonance value. Even more, below you have Quantization mode which allows you to quantize these random value to various modes. You can find different scale quantizations, chords and even wovel quantization. In the last panel control Mix you can control the mix of processed and unprocessed audio signal and with Gain dB you can control the volume of the filter output. The possibilities with this effect are vast but this effect is maybe not so suitable for processing simple static waveforms but more complex sound sources. Try it out with some samples from Absynth sample library and you will see this is no ordinary effect. We will explore this effect in detail in one of the future tutorials since one of the Master effects in Absynth called Aetherizer is actually very complex version of this effect but with some much more advanced features. Audio modulation effects are audio effects which uses an oscillator to modulate the audio signal. They are very important part of Absynth since they complement oscillator and filter modules to produce some very unusual sounds. Waveshaper is not just a simple distortion module but in combination with waveform selector in can produce some very complex and specific effects. With waveshaping we introduce additional harmonics in our sound. Waveshaping reacts to the amplitude of the input signal: the sound changes depending on the volume envelope of the oscillator or any other form of oscillator volume control. So the input parameter in waveshape module is very important. It defines the actual waveshaping effect (in non-linear fashion) on your signal and it’s not just simple volume control. The output control is used for compensating the overall loudness of your signal. By setting the Phase parameter of the Waveshape module you can change the character of the effect even further. The ring modulator effect takes an incoming signal and modulates it with internal oscillator. It basically multiplies the amplitudes of both signals. This introduces sidebands in the sound which makes Ringmod effect great source for producing all sorts of non-harmonic timbre modulations. The pitch of ring modulator effect can be specified as with oscillator modules. You can also specify the mix of un-modulated and modulated signal with balance control and also choose the waveform for the modulating oscillator. In Freqshift mode, the Modulator module produces a frequency shift via a feedback loop. This also leads to similar sounding effect as with ringmodulation but the frequency shift effect produces a bit more subtle and controllable effect especially with more complex waveforms (such as saw wave). Also great for various modulations of basic tones. Note that you can specify the frequency of modulating oscillators in Ringmod and Freqshift effects in the same way as with Absynth main oscillators. In Trans and Ratio mode the oscillator will follow the pitch of the note. But if the frequency is specified either in Hertz or Notes the frequency setting of the oscillator will be static. The effect is quite different if ringmodulator (or frequency shifter) effect follows the pitch of the note or it is static in pitch. Another very interesting feature of certain Absynth filters is the feedback panel. The Feedback Loop panel is available for following filter types: LPF 2 Pole, LPF 4 Pole, LPF 8 Pole, Allpass 2, Allpass 4, Allpass 8 and Supercomb. With feedback mode you can send some of the signal from filter output back to filter’s input. This strongly affects the resonance parameter of respective filters. You can choose between various feedback modes. In the waveshape mode the waveshaper is inserted in the feedback loop. You can adjust the feedback amount, waveform type and also the phase of the modulating oscillator. In combination with different resonance settings of the filter (in waveshape feedback mode) you can create some very interesting distortion and saturation type of effects. Great for bass and all kinds of lead synth sounds. This mode is really worth exploring since it can turn Absynth into very dirty sounding synth. Here is a simple sine wave trough LPF 8 Pole with feedback in Waveshape mode. I have automated the feedback amount over 8 bars. Imagine what you could do with other waveforms than sine. Adjusting the phase changes the character of distortion effect. This little sign marked in the picture below inverts the phase of the waveform which can change the character of the effect depending on the various filter settings and waveform used. You can also use feedback in Freqshift or Ringmod mode and process the signal in the feedback loop with frequency shifter or ring-modulation effect instead. Here you can adjust the frequency of the oscillator and also the mix amount of modulation. 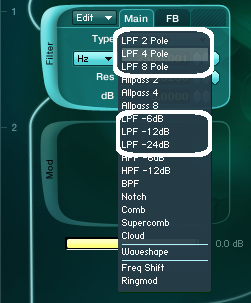 Here you can hear simple saw processed with LPF 8 Pole filter with feedback in Freqshift mode. The modulation you hear is automated pitch of the Freqshift oscillator in the filter feedback panel. Note that all three feedback modes are highly dependent on the resonance setting of the filter. Another thing we should look into is wave morphing. We know you can morph the waveforms in oscillators but you can also morph the waveforms used in frequency shifter, ring modulation and waveshape audio effects and even waveforms in the filter’s feedback panel. Very useful for dynamic changes in your sound, everything from subtle to extreme modulations. Here is simple sine wave going into the frequency shifter with morphed waveform. This mode is something really worth exploring if you are into creating FX sound effects. As you can see, Absynth’s powerful oscillators are just one side of the story. With all these filters and effects in Absynth you can shape and drastically transform even most simple waveforms. In combination with Absynth’s modulation capabilities the options are endless. Try to explore all these options and experiment as much as you can. You’ll end up with some amazing sounds in no time.